Here you will find Area Descriptions and Maps. Thanks to our sponsors for helping us get this information out to snowmobilers. Donate HERE or JOIN today. Our primary riding area is Kebler Pass Colorado. It lies in just the right spot to get clobbered by most passing storms. The snowpack is often on the soft side, with zero snow a rare occurrence. If you want deep powder with a quality base then Kebler is hard to beat. Our groomed routes follow the main roads. We groom Kebler Pass road, Ohio Pass road, Rolling Hills through the Irwin Campground site, Splains Gulch and Lost Lakes. Everything in between these routes is a boondockers delight! Please, be aware that avalanche hazards are quite numerous. Even our parking lots sits on the edge of a HUGE slide path. Kebler also borders Wilderness Areas to the North and South. Check your maps and know where you are. Kebler, like all of our open riding areas, is multiple use. Please, be prepared to slow way down for skiers and snowshoers. They are welcome to share our state-funded grooming, as well as our superb powder. Most skiers will be heading into the Wilderness Area for their fresh tracks. Loud pipes are discouraged in all of our drainages so that users can enjoy. Slate River is to the North of Crested Butte and is mostly expert terrain. Be careful, almost everything in here can slide. Stay out of Oh-Be-Joyful Wilderness Area. 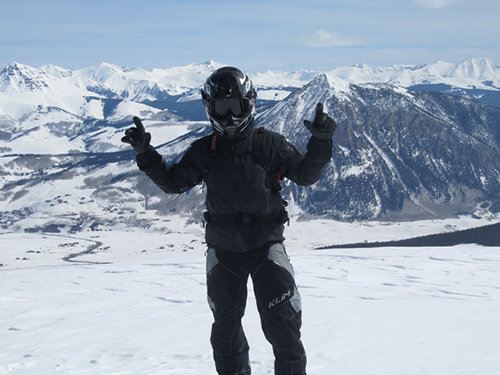 Washington Gulch lies North of Crested Butte and has moderate terrain with LOTS of skiers. Everything West of the road is closed to sleds. Permits are required to ride here in an attempt to keep snowmobilers educated about the boundaries. They are free and available from the Chamber of Commerce at the 4 Way Stop in Crested Butte. Gothic Road and the Upper East River are closed to sleds. The closure is mostly a result of the Rocky Mountain Biological Lab. We would like to see a route through re-opened so that sleds can access Paradise Divide. Maybe the permit system could work for us here. Brush Creek and its drainages are only open for a short piece of the road. Just enough to get skiers a little closer on their sleds. Upper East Brush Creek is also open for the more advanced bowl hopper who can find a way in from the top. Farris Creek is open to sleds and has a couple of meadows that could be fun. Cement Creek is the gateway to a vast riding area between Crested Butte South and Taylor Park. The first 5 or 6 miles of Cement Creek Trail are trail riding only. After the turn off for Reno Road, it is all open to sleds. Use extreme caution riding out here. The snow tends to be a little rotten and there are lots and lots of slide paths. Don't expect help to come sledding by.